3,800 B.C. to 525 B.C. A. 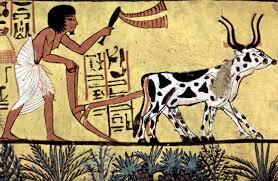 Ancient Egypt was a strip of land in northeast Africa through which the Nile River flowed. The Mediterranean Sea was to the north, and deserts were to the west, east and south. These natural boundaries served to protect Egypt from invaders. Egyptians called their land Kemet, meaning Black Land. This was in reference to the dark, rich, soil the Nile River deposited on its banks. 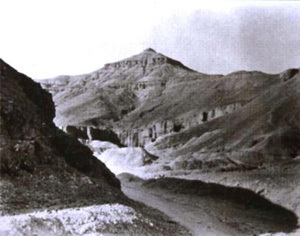 Egyptians called the surrounding deserts Deshret, meaning Red Land. The Nile flows north out of the mountains of central Africa. It breaks apart into several tributaries (The Nile Delta) at the northern tip of Egypt, and empties into the Mediterranean. Since the Nile’s source is from the mountains, southern Egypt was called Upper Egypt, and northern Egypt was called Lower Egypt (weird, no?). The Nile flows 600 miles through Egypt. It is the sole reason why civilization began in Egypt. Every year the Nile flooded its banks. The flooding started in July with the rainy season in central Africa. The floodwaters usually went down in September, depositing, a dark, rich, fertile soil upon its banks. Egyptian farmers plowed and seeded this soil. The soil was so fertile; it could yield two crops a year! That’s big eatin’! The Nile was Egypt’s chief source of transportation. 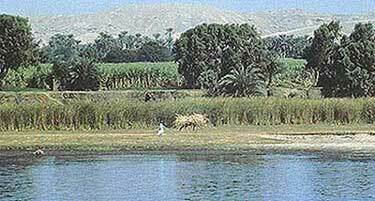 Egyptian people lived along the banks of the Nile or the Nile Delta. The social structure of Egypt consisted of five basic classes. The three elite classes consisted of the royal family, priests and priestesses, and wealthy nobility. The fourth class consisted of scribes, officials, and artisans. The fifth class consisted of peasant farmers. 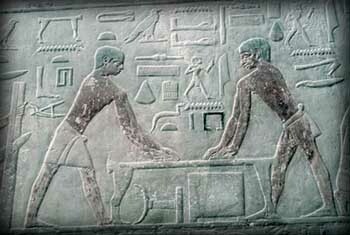 Around 1570 B.C., two other classes were added: professional soldiers (near top), and slaves (very bottom). Although there was slavery, slaves never made up a major portion of the Egyptian population. This class system was rigid. People could improve their status through marriage or success at their jobs, but this was rare and difficult to do. The gender roles of Egyptian men and women were mostly typical for the ancient world, but women did enjoy more rights than their Mesopotamian counterparts. Women could not hold a political office, but could take over her husband’s duties while he was away. Women could hold property, and do as they wished with it. Property often passed through the female line in families. Women could divorce, and received one-third of the property and custody of the children. The common labor for women was cooking, baking, spinning, weaving, and managing the household–just like in Mesopotamia. Beer brewing was also regarded as women’s work–just like in Mesopotamia. Women could also be performers, nurses, hairdressers and housekeepers. Men could hold political office, work on major building projects, farm, become an artisan, or become a scribe. Both men and women from the upper classes could attend school, but only boys went to scribe school, and therefore only men were scribes. Egyptians viewed existence as cyclical–that is, a person is born, dies, and is reborn (if he/she so chooses) in a circular pattern. The afterlife was seen as composed as having all the good things life had to offer, but to enjoy it, one had to make preparations while living. 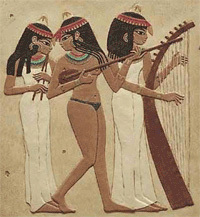 Egyptians basically believed that every person was composed of three essential elements: the body, ba, and ka. What makes it confusing is that these elements can be interchangeable, and their purposes are difficult to understand to the modern mind. The body was basically seen as a vessel that carries you through life. The body does not last. It changes, grows old, and dies. The ba can be best described as one’s personality; essentially what separates one individual from another. The ka is perhaps the most important element. It can best be described as one’s soul. It is a person’s life force. When the body dies, the ba and ka do not. They separate from the body, and go together into the underworld, called the Duat. However, the ba loses its emphasis and the ka is what becomes truly important. They pass through a number of zones before reaching the zone of Osiris. Here, the dead person’s heart is weighed in judgement. 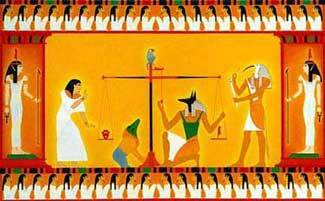 The heart and the feather of Maat are placed on opposite sides of a scale. If the heart is heavier than the feather, the person led a sinful life, and will be denied a place in the afterlife. Ammit, the Devourer, eats the heart, and the person is destroyed for eternity. If the heart is lighter (or the same) as the feather, then Horus leads the person’s ka to meet Osiris, and it gains entry into his kingdom of the dead. 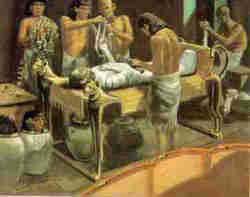 The Egyptians believed that the dead body must be prepared in such a way that a person’s ka can recognize it. The ba helps the ka recognize the person’s body soon after death. If the ka cannot recognize its body, then a second death occurs whereby the life force is extinguished and a nothingness occurs. This is really bad to an Egyptian. If all is successful, the ba and ka join together to form akh. Akhs may be reborn into the living after enjoying a very long period of paradise. Unfortunately, the afterlife was really meant for the rich and powerful. They were the only ones able to afford a well-done mummification, and a tomb that offered protection from nature and thieves. The pharaoh especially needed to survive the afterlife. 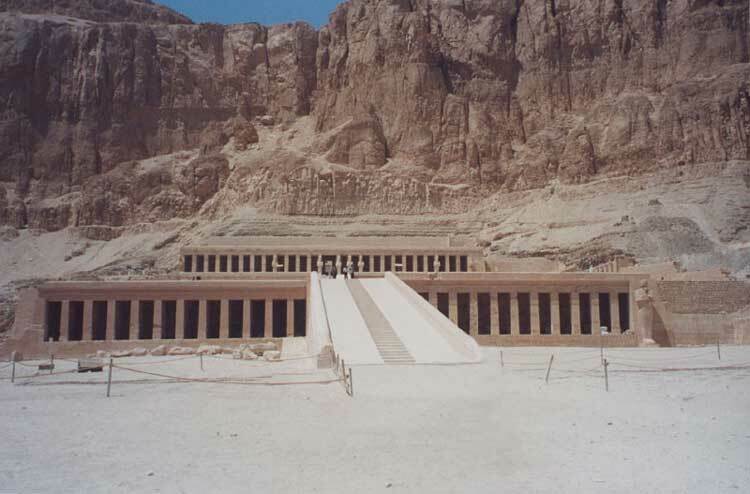 That is why such pains were made to build the pyramids and elaborate tombs in the Valley of the Kings. This elaborate afterlife was described in detail, along with spells in The Book of the Dead. Amon-Ra: The combined gods Amon and Ra, rolled into one. They give the pharaoh his right to rule, and after 2,400 B.C., the pharaoh was seen as the son of Amon-Ra. Ra: The main god of Upper Egypt, and the sun god. Amon: The main god of Lower Egypt, and king of the gods. Osiris: God of the underworld. The pharaoh becomes Osiris upon death. Horus: God of the sky and son of Isis and Osiris. The new pharaoh becomes Horus upon taking the throne. Thoth: God of wisdom and learning. He records the weight of a dead person’s heart against the weight of a feather. Ammit: A monster-god who eats sinful hearts. Anubis: God of embalming and watcher of the dead. He was present at the heart weighing. Maat: Goddess of truth and justice and the balance between order and chaos. She was present at the heart weighing. Seth: God of chaos and everything bad. The pharaoh was king of all Upper and Lower Egypt and all territories controlled by Egypt. He was more than a king, though. The pharaoh was seen as the living Horus, the sky god. The pharaoh looked upon his people as children. Whenever a drought or famine struck, the pharaoh’s legitimacy came into question. 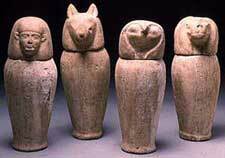 These were often times of political turmoil, and pharaohs were occasionally replaced. Egypt was divided into 42 provinces controlled by Nomarchs, or governors. Nomarchs were under the control of the pharaoh. Before the first pharaohs, Nomarchs were petty kings ruling small territories within Egypt. A. Pre-dynastic Period 3,800 to 3,100 B.C. This period marked the beginning of inhabitation of Upper and Lower Egypt. Nomarchs ruled territories and fought each other for hundreds of years. Eventually, two kingdoms were established: one in Upper Egypt and one in Lower Egypt. Civilization officially began around 3,100 B.C. when Upper and Lower Egypt were combined and rule fell under one king. B. Early Dynastic Period 3,100 to 2,700 B.C. This period began when King Narmer (Menes in Greek) unites both Upper and Lower Egypt. 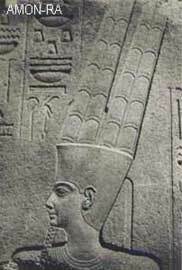 Narmer becomes the first pharaoh and establishes the first dynasty (a series of rulers within the same family). 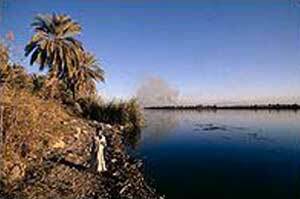 Narmer founded the capital city, Memphis (Hut-ka-Pteh: House of the Ka of Ptah), which marked the boundary between Upper and Lower Egypt. C. The Old Kingdom 2,700 to 2,150 B.C. This was the period in which the pyramids were built. The strongest pharaoh of the Old Kingdom was King Khufu (Cheops in Greek). 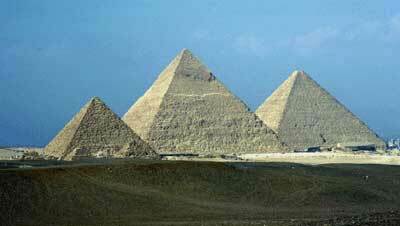 His pyramid is the Great Pyramid at Giza. The Great Pyramid remained the tallest structure in the world until the Eiffel Tower was built in 1889. 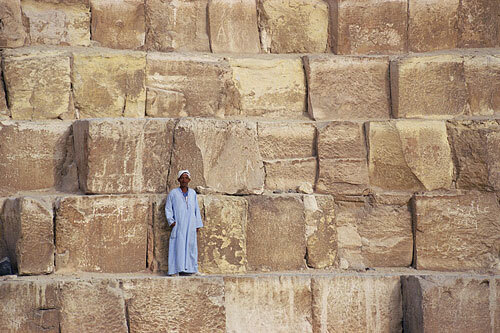 The second largest pyramid at Giza was built by Khufu’s son, Khafre. 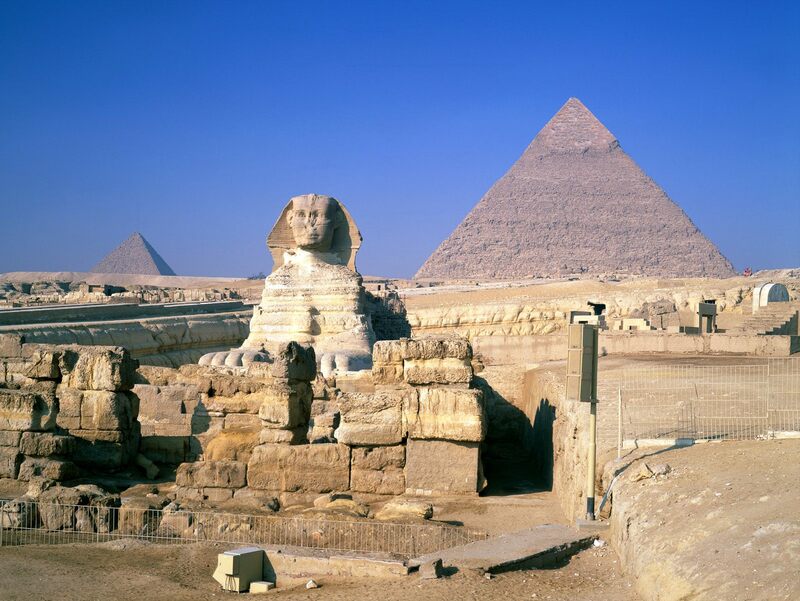 It is believed it Khafre’s face is the face of the Sphinx. This period ended with a rise in power of the Nomarchs over the pharaoh. D. The Middle Kingdom 2,150 to 1,650 B.C. This period began when one of the Nomarchs, Mentuhotep, seized power and destroyed his rivals. He began a new, powerful dynasty of pharaohs. The period ended with the invasion of the Hyksos. The Hyksos had superior weapons and military might. They ruled Egypt for about 100 years. The Hyksos controlled Lower Egypt, extending their power to as far south as Memphis. The pharaohs of Upper Egypt never accepted Hyksos rule. They strove to unite the Two Lands again. They adopted Hyksos weaponry and military tactics and eventually waged open war on the Hyksos, initially with devastating consequences. 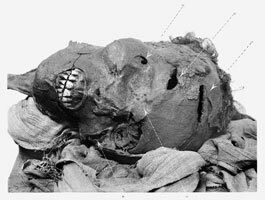 The first pharaoh who attempted to destroy the Hyksos was Seqenenre Tao II. He was brutally killed in battle. Tao’s family did not give up, however. His two sons continued the war. Tao’s youngest son, Amosis, would eventually succeed. E. The New Kingdom 1,650 to 1,100 B.C. This period began when King Amosis drove the Hyksos out of Egypt. 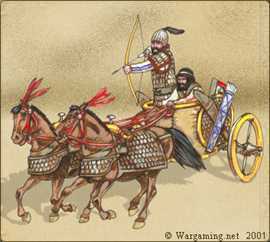 The Egyptians adopted the fighting style of the Hyksos, including the use of chariots and bronze weaponry. This is Egypt’s strongest period and is marked by the conquest of many surrounding territories, including Palestine and parts of Mesopotamia. Egypt also controlled Kush to the south at this time. The Kushites in central Africa had been long-time trading partners with the Egyptians. This was the period of Thutmose I and Thutmose III (Both were great conquerors), Queen Hatshepsut, Amenhotep (a.k.a. Akhenaton), and Ramses the Great. 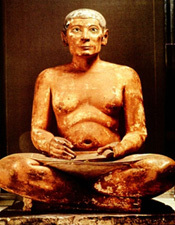 The New Kingdom was severely weakened by Amenhotep, who later changed his name to Akhenaton. 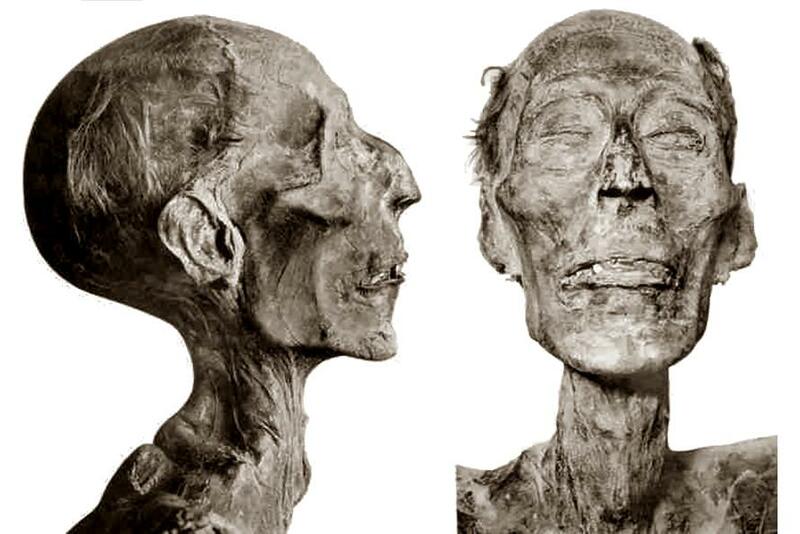 Akhenaton was a weird one to the Egyptians and generally disliked. He did away with the worship of many gods , and instead insisted on the worship of the one god, Aton. The old-time priests obviously did not like this, and when Akhenaton died, they quickly resorted to the old practices. 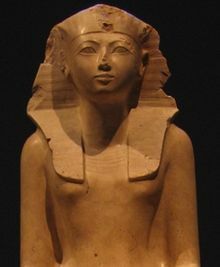 Akhenaton’s queen was Nefertiti, and their son was Tutankhamon (King Tut). Under A khenaton’s rule, Egypt lost much of its conquered territory. Egypt never fully recovered. 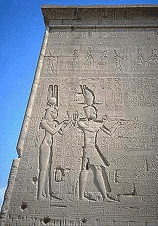 Pharaohs Seti I, and Ramses II (Ramses the Great), were powerful, but could not regain all that was lost. Perhaps one of Ramses’ greatest feats was not conquering, but defending Egypt from being conquered by invading Hittites. Hebrews had been living in Egypt since the last days of the Hyksos. 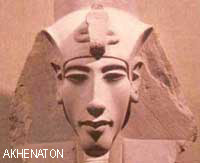 Some scholars believe that Akhenaton may have been influenced by the Hebrew belief in one god, although there is little evidence to prove it. They were eventually enslaved by the Egyptians. Later, during the reign of Ramses the Great, the Hebrews left Egypt to return to Palestine. According to tradition, it was Moses who led them. Egypt had about 10 more dynasties that ruled after the end of the New Kingdom, but much of it was under foreign control–Kushites, Assyrians, etc. Egyptian control of Egypt by Egyptian pharaohs ended in 525 B.C., when the Persians conquered it. Afterwards, Alexander the Great would rule for a short while. Then the Ptolemy family ruled. Ptolemy was one of Alexander’s best generals, and he seized Egypt soon after Alexander’s death. 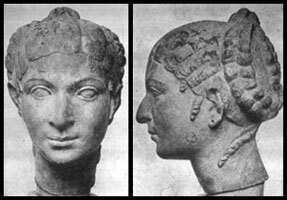 Cleopatra was the last Ptolemy to rule Egypt. Rome conquered Egypt from her in 30 B.C.